So, riddle-me-this…typically when you get two great actors such as Robert DeNiro and John Travolta in one flick you have an instant movie classic, right? Well, let me solve this riddle and inform you that this isn’t always case and Killing Season (2013) is one of those. Don’t get me wrong, this certainly was not a bad movie. But neither was it a particularly good movie. This simply was a movie that seems like it “didn’t happen”. It didn’t have a soul, nor conviction. In other words, the movie started and then it ended. 1 ½ hours later and there was no meat in-between in spite of some high action scenes. I can’t find the right way to describe how this movie missed-the-mark other than it felt like DeNiro and Travolta did a personal favor for a movie-director friend. Killing Season opened with a disturbing scene depicting some awful events that took place during the Bosnian War. While this scene was quite emotional this could have set the stage for a good plot, especially considering the star talent of both Academy Award winning actors. There was some attempt by the director to create an emotional attachment with the characters throughout the film. Yet in spite of the greatest of Robert and John’s acting talent, it just didn’t work well for me. Therefore I can easily summarize Killing Season as this: “Start movie : Some action here in the middle : End movie”. The movie felt like it wanted to be great but it was just blah. This was a movie that seemed to have great potential so I was a bit disappointed in this under-achiever. 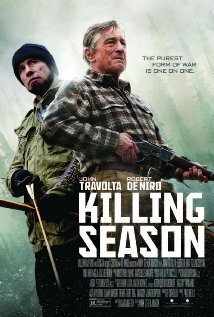 If it weren’t for Robert and John acting in this film then Killing Season would get a much lower Steeler-Star rating however, in the end this deserves an average rating of 5 out of 10 Steeler Stars.